Slides! Slides! Slides galore! 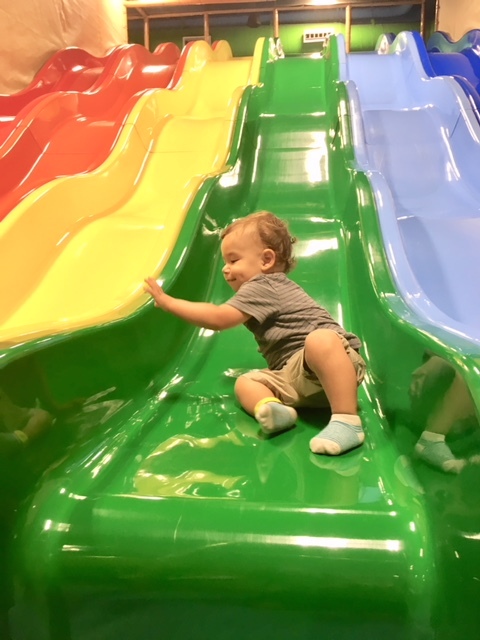 This indoor playground is packed with all sorts of fun drops! This is such a fun spot with loads of things for toddlers and young children to do! We started out at the Mini Beez area that is designed for toddlers and is safely padded every square inch. There's fun stairs to climb, bridges to cross, and blocks to build. We spent a good 30-45 minutes here exploring with our little one. By the way, my hubby and I both came with our little guy. A little heads up, make sure to bring your own socks! Everyone, including your babe, needs to be wearing socks. If you do not have any, you can buy some up front at the cash register. Then we headed over to the Toddler Play Zone. This play area is like a little pretend town with a bank, hospital, grocery store, and pizzeria. And the little ones are on the go, playing make believe, and using their imagination. Verdict: Jacob thoroughly enjoyed his time at Billy Beez, Anaheim, and we plan on coming back really soon! It would be a great option for play time, especially when the weather isn't agreeing with you, and you want to get out and explore! Next time, we'll have to take advantage of the Honey Cafe, and get a slice of pizza! It looked so good!